When Fiance and I arrived to the BrewWorks for our tasting, we were given another quick tour of the facilities, which was helpful since we haven’t seen our venue since June, and it has drastically changed to the tune of offering another finished floor. The new room in the penthouse of the building was even more spacious and beautiful than the one we had initially reserved. And yes, Wendie informed us, it would be available for our wedding date. Already, our day was getting off to an auspicious start. After the tour, we were lead to our private tasting room, where a table had been dressed in our chosen wedding colors (burgundy, black, and silver) and the tiered votive candle centerpiece had been lit for some fine Sunday afternoon ambience. The head chef at the restaurant presented us with our meal, poured us two glasses of champagne, and bade us a happy feast. While we dined over hummus assortments, cheesy puff-pastry appetizers, and mango salsa-topped salmon, Wendie helped us plan the structure of the day – you know, trivial details such as when our ceremony would be starting, whether we wanted to be seated at a headtable or a sweetheart table, band or dj (that question seems to pop up frequently), and so forth. Visit a baker for our cake tasting. 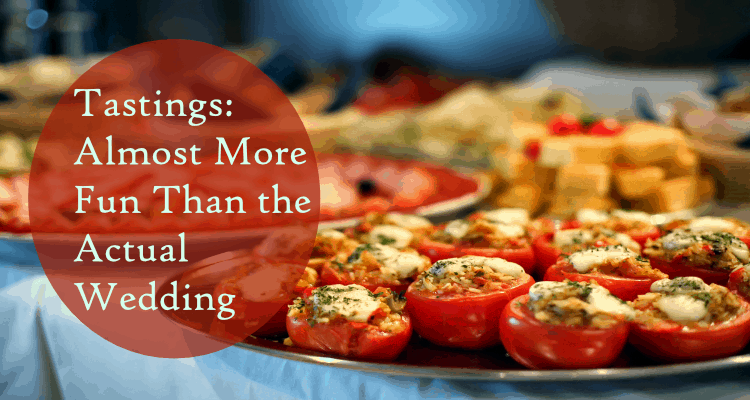 Did your caterer provide a tasting prior to the wedding? What tips would you give brides prior to attending their tasting?